We need to think out of the box; we are thinking too locally. 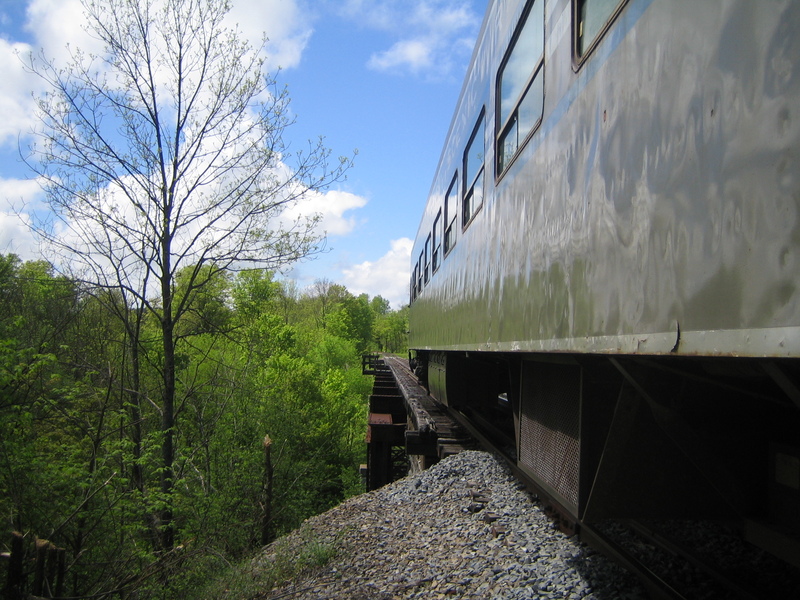 What happened to the Adirondack Railroad in the 1960s and ’70s has no bearing on today’s reality. It does not make sense to compare the railroad of the past with the potential of the railroad today. Times have changed dramatically. Back then, all railroads were struggling to survive, with both passenger and freight operations in trouble. Good planning, thinking outside of the box and containers brought freight back. Innovative methods were tried and succeeded. Passenger service was a mess during that time, equipment was poor, service was not good, and people were abandoning a good way to travel because it was no longer a good way. But that was then. Now we have Amtrak, which came along, cleaned up old equipment, offered fewer trains but somewhat improved service, and that evolved with baby steps into the really good trains we have today. The trains are nice, the service great. Trains run full all across the country, with more trains being added each year. Pretty good for a service that everyone said would fail. Go ride the Acella at up to 150 mph between Boston and Washington through New York. Ride the Cascades trains on the West Coast. Try the Superliner double-deck trains that regularly go west from Chicago – made right here at Bombardier, by the way. Bottom line: Trains are coming back strong as a real part of our lives. OK, we have a tourist train here right now, and that’s all we have. But plenty ride it; we carried 22,000 on just our little 10 miles, and 70,000 we have run on the whole system, and the season isn’t over yet. We sell a book in our gift shop that tells about all the trains offered in the U.S., and it’s about a half-inch thick. More are being developed every year. Rail fans and tourists flock to them just to ride a train again. That means big bucks for the areas they go through. Iowa Pacific has taken over the Saratoga-to-North Creek train and made it into a real deal with dining, domes and lots of passengers. We can have that here; all we have to do is keep doing what we are doing and finish the track work already started and well under way. We are more than halfway done! I know some folks are saying we have to redo the unit management plan. I disagree. As the UMP stands now, it allows for the development of the rail service along with trails and expansion of it. No new plan needs to be done, and no permits need to be sought out. When more material and labor are available, we can continue the rehabilitation of the line. The last thing we need to do is to stop work and change canoes mid-stream. Let’s not further delay implementation of a plan that was already thoroughly debated and is now well under way. It makes no sense to pull out an existing rail line to make a trail when we have miles of them already but only one railroad. Where it is practical, we can have the trail alongside of the tracks, and that’s good. With the track work completed, we could pull big trucks off the narrow roads we have, and we make it possible for folks to ride up rather than drive the congested roadways. Let’s consider a trail-only conversion. Our line goes through some of the most rugged and beautiful country in the Park. It is, however, very remote. There is nothing there. If you break down, there is nothing close you can walk to and, what’s even more concerning, spotty cell service at best. I’m not sure I’d like to be riding a bike through some of that area without a train coming along to pick me up if I need it. We also experience the same thing other roadways do – washouts. If the tracks were gone, how would we get equipment in there to make the repairs? Do you want to drive a big dozer or back a big dump truck miles down on a narrow bike path? It would be a full-time, never-ending job and difficult at best. Yet working from the track, it’s easy to zip in and out, and you don’t have to steer! Yes, the tracks do need some new ties, but they are just ties – nothing to be afraid of – and more than half of them or better remain in good condition! And the rail is good heavy rail, in great condition. All we need are some more ties. We need to get our trains running to Utica as soon as we can. We want to add trains to Tupper Lake as soon as we can, with Lake Clear as our first goal. Trains are going to be needed soon with this fuel crunch we are in. A ton of freight can be hauled 500 miles on a gallon of fuel, according to a CSX television ad. We can haul hundreds of passengers on very little fuel. We can reduce our carbon footprint with trains. Think of the cars not going on the road to haul 500 people. And in Utica, we connect with one of the country’s busiest main lines, so travel by Amtrak to all areas of the country is possible.